As its name suggests, the Vaporesso Swag 80W TC Kit has sophisticated style unmatched by any other 80W kit on the market today. This kit consists of a 75mm x 48mm x 25mm Vaporesso 80W Temperature Control Box Mod as well as a 48.5mm x 22mm Special Edition NRG Sub-Ohm Tank. Powered by a single 18650 high Amp Lithium battery (Not Included), Vaporesso has outfitted this TC Mod with only the most advanced technology available, featuring an OMNI 2.0 Board chipset that allows for a remarkable range of modes and settings. The Swag features Vaporesso’s tried-and-true power output modes that have made an appearance on all of their new and improved OMNI 2.0 devices, including Temperature Control, Smart Variable Wattage, TCR, and Bypass mode. The OMNI Board, however, also allows for more advance settings such as CCT (Customized Curve of Temperature) and CCW (Customized Curve of Wattage). 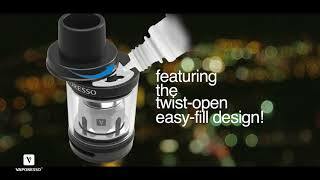 These more advanced settings allow you to have remarkably precise control over your vaping experience. The Swag’s wattage ranges from 5 to 80W while the Variable Temperature Control ranges from 200 to 600F (100 to 315C). These high temperatures are suitable with all of the most popular temperature control wires (Nickel 200, Titanium, and Stainless Steel) and will provide a different element to your vaping experience depending on which wattage and wires your prefer to vape with. The Swag is equipped with an operational resistance that fires as low as 0.05 ohms and can handle builds as high as 0.5 ohms, and offers a maximum voltage that tops out at 8.5v. The mod features a rugged Aluminum Alloy chassis that is further protected by Vaporesso’s unique In-Mould Labeling construction. This IML coating not only gives the mod greater wear-resistance, but also provides better quality graphic designs, increasing the overall swagger. Around the outside of the device you’ll find a brightly lit OLED display screen that features a user-friendly interface to display all your essential live vaping stats. Even though this mod has the capacity for 2A fast-charging, this screen can show you how long it will take for the battery to charge. Despite the Swag’s ultra-fast 2A charge rate, the OLED display will show you how much time is left for your battery to reach a full charge. The lightweight 46g NRG SE Sub-Ohm Tank makes the perfect crown to put on top this powerful mod. Constructed out of Stainless Steal and Pyrex Glass, the NRG Tank features an easy-to-use twist open top-fill design that’s capable of holding 3.5mL of e-liquid. Near the base of the tank you’ll find dual adjustable airflow slots that give you complete control over your vapor production, no matter which vaping style you prefer. In utilizing GT Core atomizer heads, this kit includes a pre-installed NRG GT2 Core Kanthal 0.4 ohm atomizer head, as well as the NRG GT CCELL Ceramic 0.5 ohm Atomizer Head (rated for best use between 30-35W) for MTL vapers that prefer a tighter draw. The Vaporesso Swag 80W TC Kit provides a stylish yet ergonomic construction that raises the bar for mid-level vaporizers. If you’re on the market for a new kit that’s capable of delivering Vaporesso’s mouthwatering flavor with some impressive cloud production to back it up, the fast-charging 80W Swag TC Kit is definitely the kit for you!